Think maxi dresses and skirts can only be worn during the warmer months of the year? Think again! With a little creative styling, these glam dresses can work for winter, too. Instead of putting them away this winter, learn how to maximize their potential by mixing them with a few other wardrobe pieces. Layer up. This is the best way to winterize a maxi dress. Invest in the right under-garments and you can wear almost anything you want on top! use pieces to layer like a second skin – they are fine and fitted so they aren’t going to add too much bulk. (optional, especially if you live were it gets really cold.) Start by adding a sweater or cardigan, then pull on a jacket or coat. Throw on some winter accessorizes, like hats, scarves, and gloves, to stay extra warm. First, choose a maxi dress that’s made from a winter-friendly fabric as opposed to, say, that unlined chiffon one you wore over the summer. Try a luxe fabric like silk for a fancier look, or a heavier one like a substantial jersey if you want to go more casual. Colour. For colour, steer clear of bright shades (which can look too tropical) in favor of neutrals or jewel tones. And if you’re going floral, make sure you choose a dress with a dark shade (like navy or black) as the base colour. Don't forget your legs! After all the coats and sweaters are layered on, do the same for your stems. 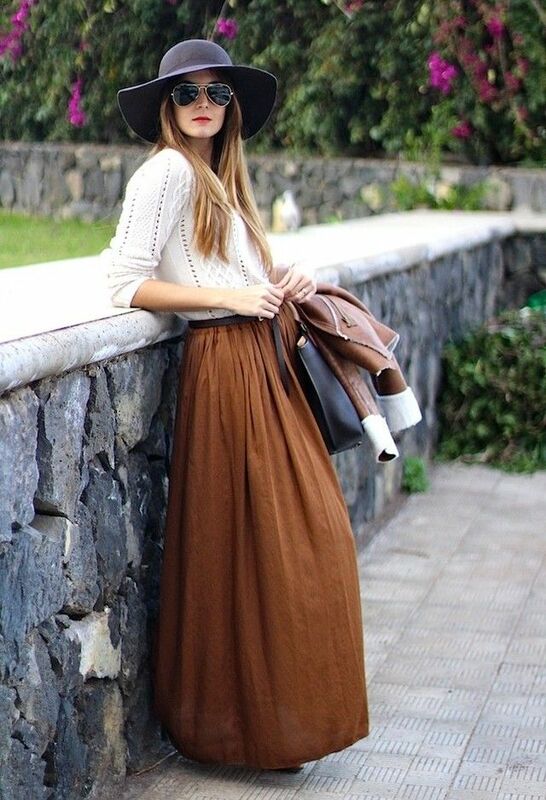 Even though the long skirt provides coverage, it can still be well, breezy under there, so add an extra layer or two. Thick opaque tights or leggings work wonderfully for this purpose. Feet first. Probably the most important element of this look has to do with what footwear you choose, and we believe that boots are the way to go. Whether they're ankle length or knee-high, flat or heeled, boots are a practical and fashionable choice to pair with your maxi dress in the winter.